Deep Learning is a part of machine learning methods. It’s a technique enabling computers to learn human’s skills. Incidentally, most of models used in Deep Learning are inspired by human brain, since we often named them “neural networks”. This designation alludes to the architecture of the method. It corresponds to several layers of neurons where each of them learn a simple task. Finally, the connection between neurons allows to learn complex tasks like recognizing objects in images. Why Deep Learning is so popular nowadays? For several years, the popularity of Deep Learning has continued to grow in many areas, especially in the biomedical field. Indeed, computer vision needs are currently more and more present, but the most efficient image analysis technologies are unfortunately not always able to detect what the human eye sees. Therefore, the power of neural networks lies in the fact that they can outperform humans in terms of object recognition in many fields. How do we use it at QuantaCell? 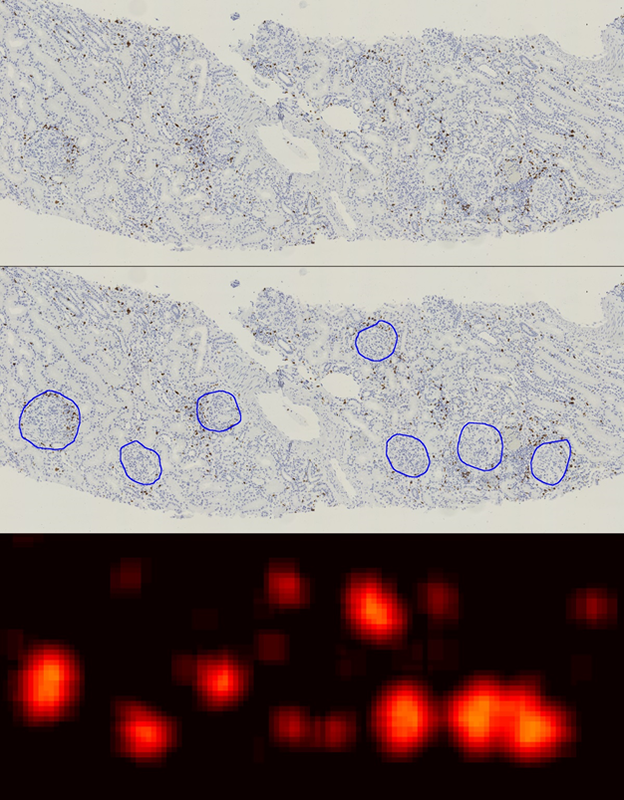 As experts in data analysis and biomedical imaging, QuantaCell uses Deep Learning and neural networks to solve various issues our collaborators face. Provided solutions is adapted to a wide range of fields (histology, clinical studies, cell biology, …) Furthermore, we can design software solutions embedding Deep Learning in an ergonomic interface. 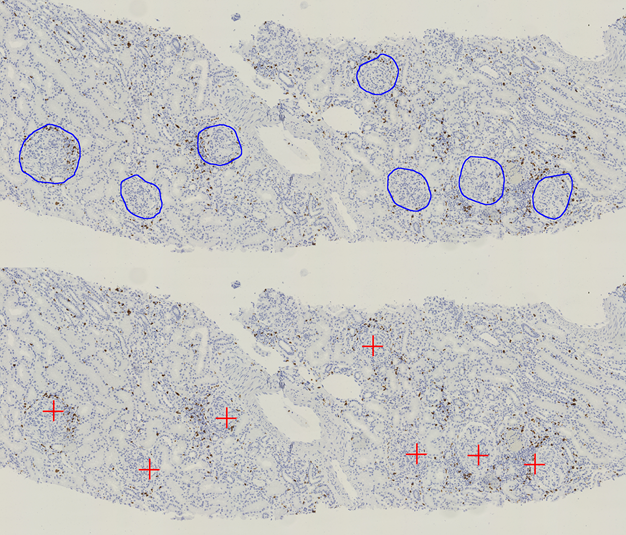 QuantaCell provides a user guided decision for detection of glomeruli on histological images. 20 virtual slides are used in this example. Haematoxylin-Eosin is used to stain nuclei (H) and a biomarker (E) of interest. The goal is to detect glomeruli without specific glomeruli marker to keep staining for another biomarker. This task is particularly difficult to process because there is almost no contrast between the sample and the object to be detected. Glomeruli can appear darker or lighter than the neighboring tissue. 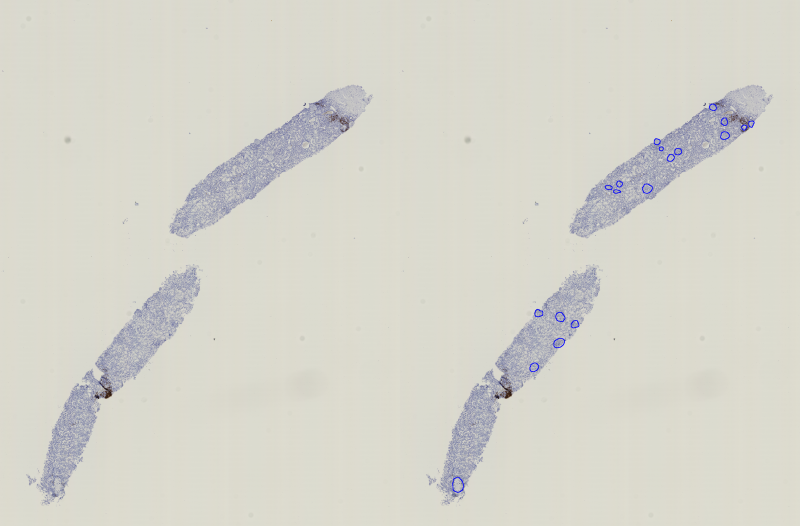 The shape and the positions of the nuclei allow expert to distinguish glomeruli even without specific staining. Thus, classical algorithms of image processing cannot give satisfactory results. We have designed a tool, using Deep Learning methods, to facilitate pathologists to quickly localize Glomeruli. We use convolutional neural network to perform this task. For validation purposes, a pathologist has defined, in all slides, glomeruli regions using Hamamatsu Viewer. The neuronal network is created to recognize glomeruli from Haematoxylin staining only (stains separation is achieved using color deconvolution). It is trained on half of the slides. Accuracy is measured in the other half of slides. Neuronal network results reflect a probability of presence of glomerulus. “Peaks of probability» correspond to expected glomeruli. Pathologist can then refine glomeruli shape. By applying a threshold of intensity on this prediction, location of the glomeruli is given with acceptable precision. Proposed locations are directly written as ndpi.ndpa files such as pathologists can easily validate and draw regions in Hamamatsu Viewer. Since there is a certain part of subjectivity in glomeruli detection, some ambiguous cases can also be detected by the network. The user can simply decide whether it is a false positive. This tool uses Deep Learning to guide the expert to quickly detect glomeruli on large samples. 83% of the glomeruli are correctly predicted. Moreover, thanks to the prediction tool, the pathologist discovers 18% extra glomeruli compared to visual inspection only. Do you want to test Deep Learning on your images ?